This recipe and photo is from Pop's he says that: "Sometimes you have a rough day and just want something quick and good...this is it!" Note: Pop's said he had some leftover cornbread muffins, all he did was heat them up and that was some good meal! He also had a little leftover chicken that he threw in! 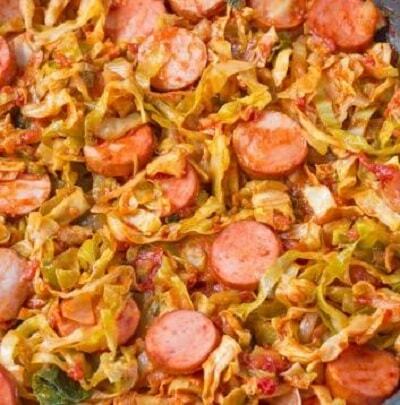 If you have some leftover cornbread or muffins, they would go great with this cabbage and sausage! If not, you might want to take the time to make some!